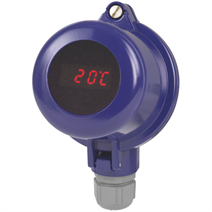 The model DIH10, DIH10-Ex integrated digital display module (digital indicator) is a universal, configurable, current loop display for fitting to electrical thermometers. The robust, compact display is only applicable where a standard signal of 4 ... 20 mA is already available. When used with the housing versions, it can be an on-site display for the entire industrial sector. Combined with the ability to rotate the connection head and the large 4-digit, 7-segment LED display is easily readable from any direction. In order to make the electrical connection, the current loop display is simple and easy to open. Buttons provide a user-friendly configuration of the display range. To operate the connection head with a model DIH10, DIH10-Ex digital display module, a transmitter (4 ... 20 mA) for the measuring point is a precondition.